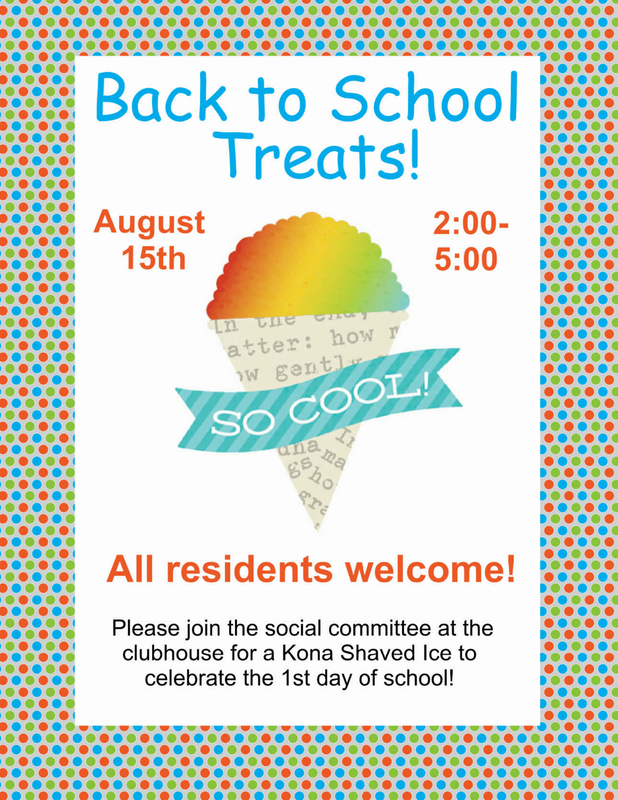 Back to School Kona Ice Truck 2016! 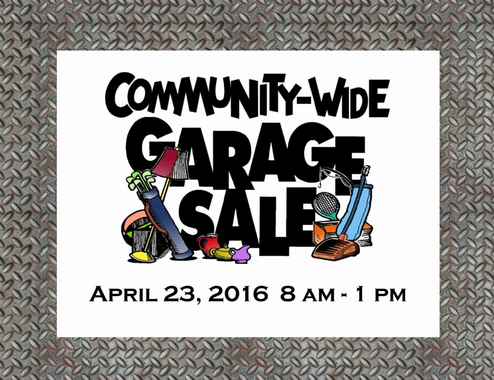 The Spring yard sale and metal recycling event will be held on 4/23 from 8-1. As in past events, there will be a collection site at the clubhouse for electronic metal recycling. When do I need to park somewhere other than my driveway or street? Please review the map to understand which day(s) your parking may be affected. Most residents live on streets which will have both sides sealed at one time. In this case, if you need your car during your sealing “Day” (8:30am until 7:30am the following day), then it must be parked in a section that is not being sealed and where traffic will not be impeded. DO NOT LEAVE IT IN YOUR DRIVEWAY OR ON YOUR STREET! Where do I park when my street is being sealed since street parking is not allowed? Street parking will be allowed on the side of the street with even house numbers during this project. Residents may park at the Clubhouse if there is room or any adjacent street that is not being sealed. Consider working with neighbors in other sealing sections to coordinate a driveway parking swap. What if my house is on a street split with “one-way traffic” as indicated on the map with two colors? Residents on “one-way traffic” streets may not park on the street while EITHER half of the street is being sealed (e.g. Day 3/Day 4). Half of the street is closed for sealing, while the other half will have one-way traffic facilitated by flagmen until 9pm. Residents may park in their driveways while the ‘other’ side of the street is being sealed since they can still exit their driveway without interfering with the sealing. Please offer your driveway to your neighbor across the street during their sealing day. When can I move my car back to my driveway after my street is sealed? What if I’m parked on the next section to be sealed? The sealing vendor will arrive at 7:30am and start removing the cones from the newly sealed streets and preparing the next section. At this time you may drive your car on the newly sealed street (no sharp turns please!) and back to your driveway. You MUST move any cars from the section to be sealed that day by 8:30am. Any cars left on the street at 8:30am will be towed at the owner’s expense. Where is the Wilson Road Entrance? The Wilson Road entrance is at the intersection of Falling Rock Dr and Wilson Rd. Google Maps pinpoints this as 3197 Wilson Rd, Land O Lakes 34638. This entrance/exit will be open Thursday, March 17th and will remain open through the entire street sealing project. All traffic must use this entrance/exit for Day 1 of sealing (Saturday March 19th unless delayed by weather). The main entrance on SR-54 will be closed approximately 24 hours until it is reopened around 7:30am on Day 2. However, please check the map to see which entrance you should use on each day of the project, as some days your house will only be accessible from one or the other. What happens if I am unable to move my vehicle from the street by 8:30am on the day of sealing? Any vehicles left on the street will be towed to another location in the neighborhood at the owner’s expense. For any questions, contact Greenacre Properties. Our Community Association Manager is Janet MacNealy at 813-600-1100 ext 147 or jmacnealy@greenacre.com. What happens if it rains during the sealing project? The sealing vendor will check the forecast frequently throughout the project. 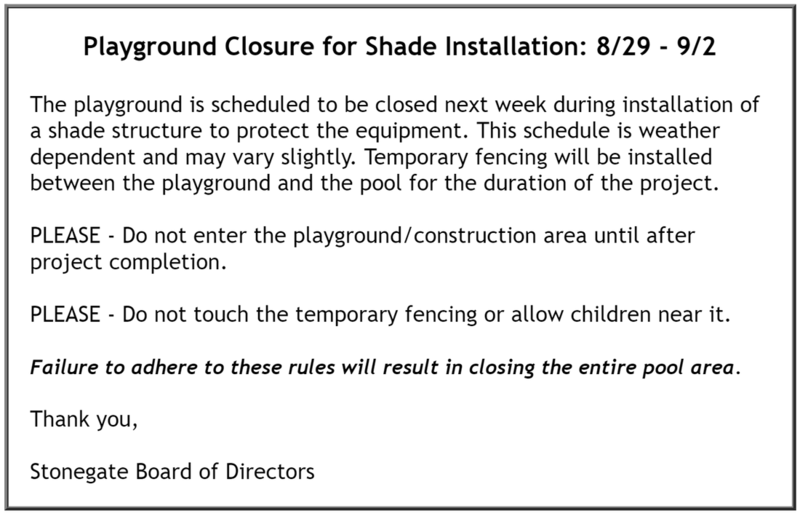 If they determine the weather will be detrimental to the project, they will delay sealing until conditions allow them to resume. 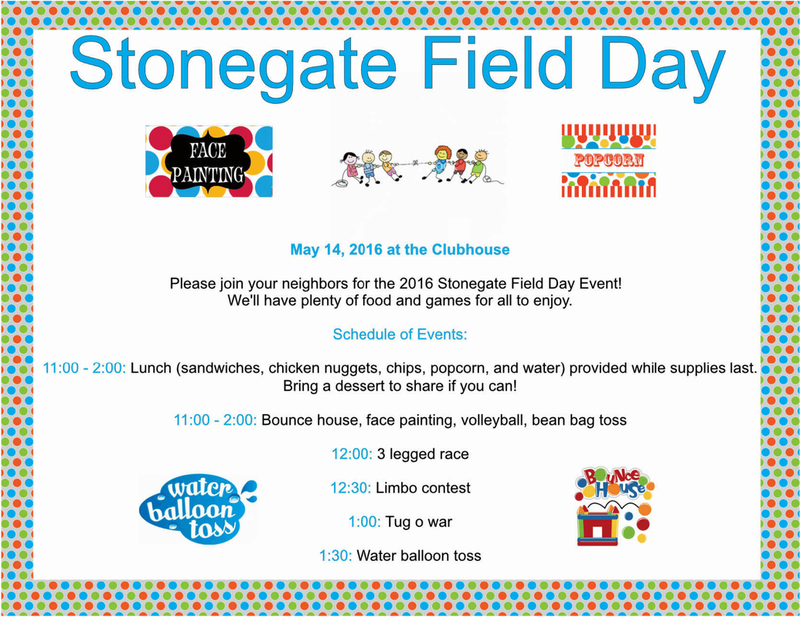 We will plan to post notification to www.StonegateFL.com when we are notified of any schedule delays. After the road is sealed, what precautions should I take to prolong its life? After several hours in the heat, the sealcoat glazes over and light foot traffic is acceptable, but not bikes, golf carts, scooters, etc. After the sun comes up the day aftersealing, the streets will be opened to vehicular traffic; however, tight turns, quick accelerations, sudden stops and heavy braking may leave permanent marks in the surface. Sprinkler systems should not be used for three days and chemicals (e.g. fertilizer or cleaning products) should not be sprayed on the new sealcoat for 30 days. What about school busses, mail delivery, trash service, etc.? Our project was scheduled during Pasco County Schools’ Spring Break, so school busses will not be running. Our regular vendors will try to work around the street sealing and will use the Wilson Rd entrance as appropriate, but residents should anticipate some disruption in services in particular on the days their road is being sealed. Who do I contact for any questions about the street sealing? For ALL issues, contact Greenacre Properties. Our Community Association Manager is Janet MacNealy at 813-600-1100 ext 147 or jmacnealy@greenacre.com. 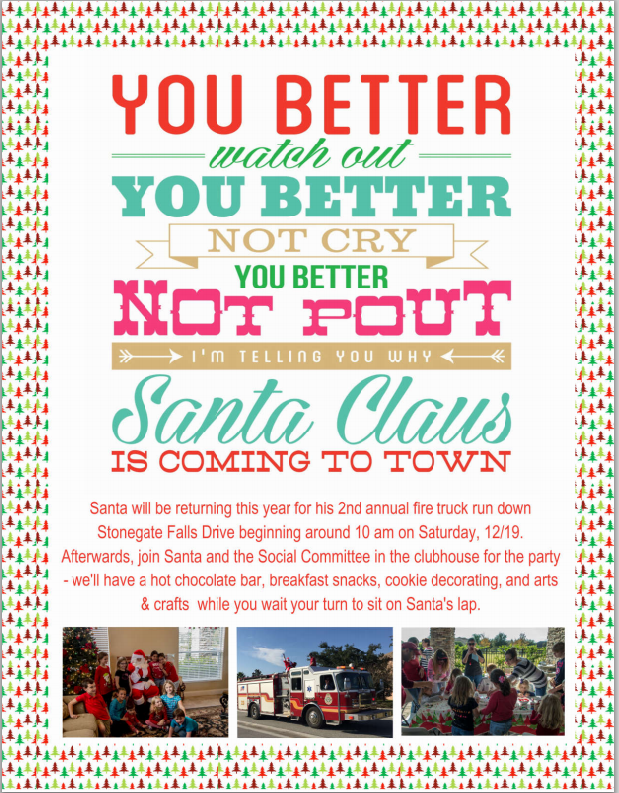 Santa will be returning this year for his annual fire truck run down Stonegate Falls Drive beginning around 10 am on Saturday, 12/19. Afterwards, join Santa and the Social Committee in the Clubhouse for the party - we'll have a hot chocolate bar, cookie decorating, arts & crafts while you wait your turn to sit on Santa's lap. These were mailed to all homeowners and renters. If you are familiar with your 3-digit directory code, it will now have a prefix of "1". For example, if your directory code was "444", it will now be "1444". Watch the training video Amberlea HOA put together that shows how the box works. 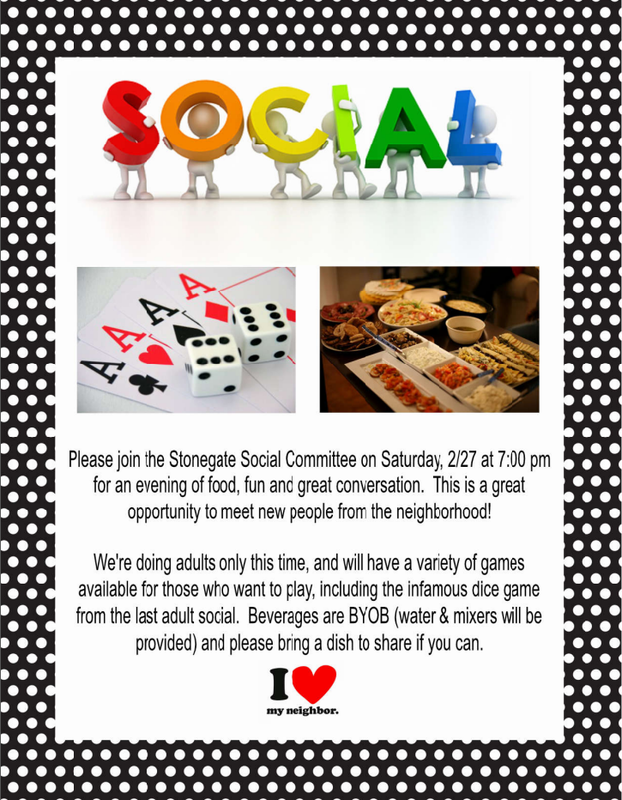 ﻿Stonegate 2nd Annual Halloween Party! Calling all little (and big) ghouls and goblins - Meet at the Clubhouse for some Halloween food and fun before trick or treating. Pizza and refreshements will be served beginning at 5 pm so everyone can have a quick and easy dinner before hitting the sidewalks. Show off your costume in our parade around the Clubhouse lawn- don't forget your cameras! Bring your carved or decorated pumpkin from home – prizes will be awarded!